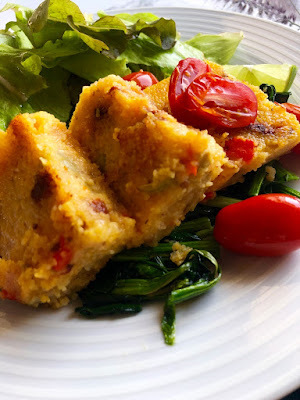 A recipe that will make you appreciate polenta for today's post. 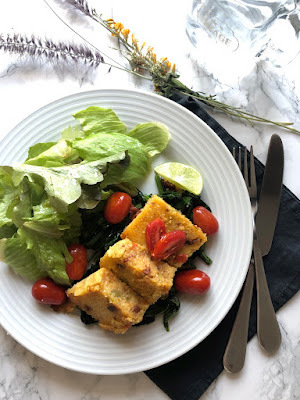 My husband told me "I don't like polenta, don't make it" I felt like I am missing out something so I was determined to make him change his mind. And I succeeded! He told me it was the best recipe he ever had. That was a big statement! I thought I'd share this recipe with you so you can also help someone to reconcile with polenta. What he does not like in the polenta is actually its mushy texture. I needed to come up with a different presentation. But polenta fries are not an option. I occasionally deep fry my food, like 3 or 4 times a year. Deep fried food is so good but we kinda have to keep it to the minimum. Our arteries will be so grateful. Ok, let's get to the point that interests us! Hope you will like it as much as we do. Comment below to let me know and don't forget to share it with your family and friends.